To sustain the health, diversity, and productivity of the Nation’s forests and grasslands to meet the needs of present and future generations. 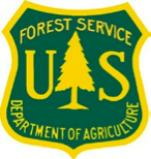 Established in 1905, the U.S. Forest Service is the largest natural resource research organization in the world.USFS manages 193 million acres of national forests and grasslands, shares responsibility with State and local agents for the stewardship of about 500 million acres of non-Federal rural and urban forests, and works with partners worldwide to protect global forest resources. The Forest Service manages national forests for multiple uses and benefits, and for the sustained yield of renewable resources such as water, forage, wildlife, wood, and recreation. Multiple use means managing resources under the best combination of uses to benefit the American people while ensuring the productivity of the land and protecting the quality of the environment. The Forest Service also provides funding and technical assistance to fulfill its role on non-Federal forest lands. In addition, the Forest Service provides international assistance in land stewardship and has its own Law Enforcement and Investigations unit responsible for enforcement of Federal laws and regulations governing national forest lands and resources. Chesapeake forests, both rural and urban, are crucial to maintaining the water quality of the Bay and its tributaries.